Taking Tribulus terrestris saponins has remarkable effects in the treatment of sterility, since it helps to improve the quality and increase the amount of sperm in man, at the same time as it is a stimulant of sexual desire and libido in women. This plant, whose millenarian origin dates back to India and China, is widely used as pro-testosterone. Tribulus t. It was used as a diuretic, tonic and aphrodisiac, in urinary problems, in gout, in pictures of impotence and sterility. Its active ingredients are extracted from fruits that contain resins, tannin, sterols, essential oils, diastase and saponins. Today it is known that the main active product is protodioscine (PTN). The administration of PTN extract increases libido in both sexes, and sperm production (spermatogenesis). Also, in laboratory tests it was observed that it dilated the coronary arteries and perfused them. It also raises levels of testosterone and luteinizing hormone (LH) and may increase DHEA levels in men. In women it is indicated in the treatments of Sexual Desire Hypoactive or Inhibited and some propose it in cases of sterility due to ovarian factors. Protodioscin (PTN), the active ingredient in Tribulus terrestris saponins, increases DHEA levels in the blood, thus increasing libido, muscle mass, general well-being and the immune system. PTN would convert testosterone to dihydrotestosterone (DHT). In turn, DHT increases the production of red blood cells (erythropoiesis) and hemoglobin with the consequent increase in oxygen transport. The PTN stimulates the germ cells of the testicles and those of Sertoli, increasing the spermatogonia, spermatocytes and spermatids (which are the progenies of sperm) without altering the seminiferous tubules. Tribulus terrestris saponins regulates the hormonal balance of the body without exceeding physiological limits. Tribulus terrestris is indicated between 500 to 1500mg of the dry extract per day. Two or three months can be used and improvements can be seen after 5-7 days. In what cases should it be avoided? Men with BPH (benign prostatic hyperplasia) or with PSA (prostate-specific antigen) high. It should not be used together with hormones except under medical supervision. It does not usually give virilizing effects in women. Known as burr and in Sanskrit as Gokshura, Tribulus terrestris (family Zigophyllaceae) is distributed in the warm areas of Eurasia, Africa and northern Australia. It is a creeping herbaceous plant up to 50 cm long, its flowers are yellow and its fruit is characterized by having thorns. 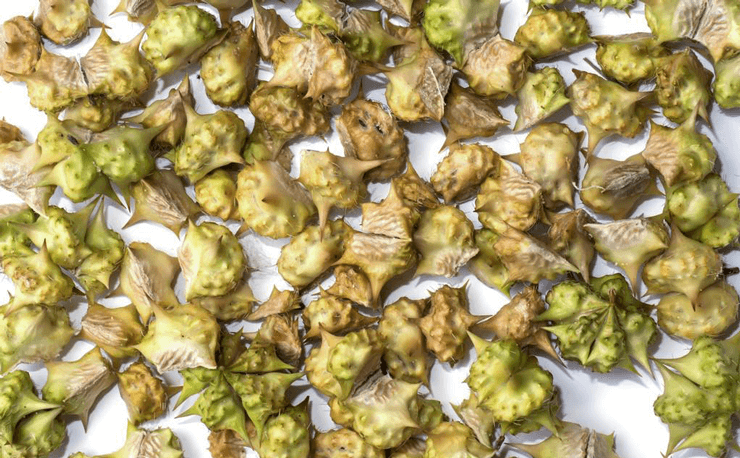 This fruit is known in China as Bai ji li and in the United States as goat head, caltrop or puncture vine. Its scientific name, Tribulu, refers to the tríbulo, weapon with four metal spikes. In ancient Greece it was already consumed to treat headache, sexual dysfunction and nervous disorders. In traditional medicine the tríbulo has been consumed to increase libido, treat urinary tract infections, as antihypertensive, tonic, astringent and for inflammation. In Ayurvedic medicine it has been used for centuries to treat impotence, sexual weakness and venereal diseases. It is a plant rich in steroidal saponins (including protodioscin and protogracillin), alkaloids (tribulusterin), flavonoids (kaempferol, kaempferol-3-glucoside, kaempferol-3-rutinoside and tribuloside), lignanamides, sterols and cinnamic amides. Its leaves, flowers and fruits are powerful tonic and diuretic. It is not recommended for people who suffer from cholestasis (condition in which the flow of bile from the liver is reduced or obstructed) and it must be borne in mind that plants rich in saponins can produce irritation of the gastric mucosa and reflux. Toxicology tests performed on laboratory animals indicate very low toxicity. It is discouraged for pregnant or lactating women. Use in children and under 18 is not recommended. Do not exceed the recommended daily dose.